ATSIDA is currently processing material collected by Dr Heidi Norman for her Koori Knockout research project. The Koori Knockout is a rugby league competition for both men and women, which has been hotly contested throughout the state of New South Wales (NSW) since 1971, and the research material collected has important value to Aboriginal communities in NSW and will be an important addition to the data archive. 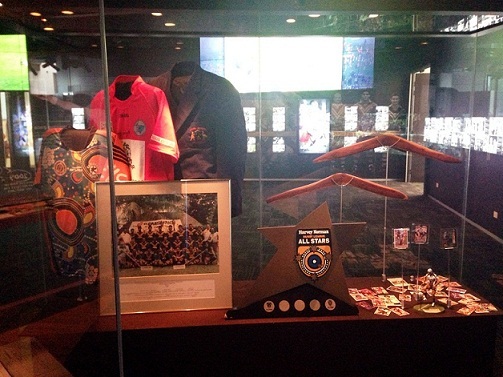 Some of Dr Norman's ATSIDA material was recently included in the 'Close the Gap' exhibition at the National Rugby League Museum in Sydney, in the section titled 'It's a Knockout'. The text from the exhibition is included here, along with a photo of the display. The NSW Aboriginal RL Knockout commenced in 1971 and has grown to be a major feature on the game’s annual calendar. It has been dubbed “a modern corroboree” for the way in which it gathers Indigenous Australians from all over and has become a cultural celebration as much as a rugby league tournament. The referee’s jersey was worn by Emily Droguett, the first Indigenous woman to officiate at the Knockout, in 2012. The Gamilaraay jersey (designed by Steve Hall), was worn at the inaugural PCYC U/16s Nations of Origin tournament in 2013.